We believe the strength of a school lies in its staff. The RGS Guildford in Qatar has the highest standards when appointing those people who will work closely with your children. 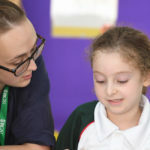 Rigorous assessments, references and the requirement for all staff to be experienced teachers with British teaching qualifications mean that only the best teachers come to work at the School. We also employ a number of specialist teaching staff to deliver our Music, Sport and Language curriculum. Apart from our Arabic and Islamic studies staff, all other specialist teachers are also British trained and qualified. The academic team are supported by an expert team of administrative and facilities staff who ensure the smooth running of the school and are always available to support parents and pupils. Following my graduation from Cambridge University, I worked in a variety of schools in the UK, China and Thailand. In 2010 I was appointed the Founding Head of School at St. Andrews International School in Bangkok. I am immensely proud to be the Founding Head of School at RGSGQ and to continue the tradition of the Royal Grammar School Guildford in an international setting. Our school ethos emphasizes high academic achievement within each individual’s potential and we aim to provide an outstanding learning environment, where students can flourish. I believe it is our role to develop happy, caring, thoughtful students who feel confident about their abilities, respect others and recognize their importance in the world. We have created a vibrant school with a real community feel at its heart, dedicated to developing confident, independent learners. Outside of school, I have a passion for travel and a love of learning about different cultures. When I’m not traveling, I enjoy watching and participating in sports; notably football, badminton, tennis and athletics, as well as chasing after my two young daughters, the eldest of which is currently at RGSGQ. I was born and raised in Shropshire, England. At age 18 I became a Teaching Assistant in a small school in Shropshire. I worked with a highly inspirational early years teacher and it was there that I caught the teaching bug. After traveling in my early 20s, I went on to study Childhood and Youth Studies with Sociology. After studying for my degree I worked in a children's home for a couple of years which was hard work but very rewarding. The teaching bug refused to leave me so I completed my PGCE and I have never looked back. Throughout my career I have been fortunate enough to work with some truly inspirational and amazing people. Before joining RGSGQ 2 years ago, I was Head of Foundation Stage at an Apple Distinguished School in the UK. I learned so much at this school about teaching, using IT in the classroom, hard work and team work. We enjoy living in Qatar, as we can travel to many countries from here and spend most of our holidays seeing the world. I have been teaching at RGSGQ since it opened its doors in 2016. It has been rewarding to see the School go from strength to strength with staff, pupils and parents working together to create a real school community. I am originally from a small town in Norfolk, England. Having worked as a one to one teaching assistant for a year, I decided to pursue a career in teaching. Graduating from the University of East Anglia with a BA in Educational Studies, I took a Primary PGCE with focus on Early Years and Special Education. Upon graduating, I moved to Thailand to volunteer. It was in Thailand that I realized that I could combine teaching with travel and moved to Kuwait and then on to Qatar. Whilst 2018/19 will be my first year working at RGSGQ, it is my fifth year as an Early Years teacher. I have worked in both Nursery and Reception classes and was appointed Early Years Coordinator in another Doha school in September 2017. I am very excited to have the opportunity to work as Early Years Coordinator at RGSGQ, as it has such a vibrant and community feel and I share a passion for encouraging independent learning. Outside of school, I continue to pursue my own study, as I view learning as lifelong. During any spare time that I might have, I am a proud member of The Angry Dragons (we're not that angry) dragon boat team and have been involved in races both in Doha and The Philippines. Like most teachers in Doha, I love to travel and do my best to make time to visit my family who are spread the world over. I grew up in a village in the North of Ireland, not far from Belfast. I am the oldest of three however we lived next door to five of my cousins so it has always felt like a large family. I studied a B.Ed Primary at Stranmillis,Belfast. During my degree, I had the opportunity to work in a Kindergarten in Poznan, Poland. I loved working at an international school and knew that it was something I wanted to do in the future. After graduating, I worked in a rural school close to my home. I taught a mixed reception and year one class and loved it! However, I felt like I wanted to try something new so I moved to London where I have been for two years. I have worked in a year one class with children from a wide range of backgrounds and cultures. I have loved being part of such a diverse community and have developed as a positive, energetic and passionate teacher. I decided to move to Qatar as I was really interested in experiencing a new culture. After researching Doha, I discovered how up and coming the city is and I knew I wanted to be part of it. I am very proud to accept a nursery position at RGS Qatar and have already been made to feel so welcome and supported by the staff. I am an advocate of creating a positive environment to aid progress - something that I believe I can find it at RGSQ. In my spare time I love to travel. During my student years, I spent some time Au Pairing in Italy, where my grandmother is originally from. I am excited about the opportunities to visit many more places that working in Qatar will give me. Some more of my interests include cooking, being active, reading and teaching the piano. Inspired by several of my Primary school teachers, I always knew that I wanted to become a teacher and travel the world. After graduating from Nottingham Trent University in 2012, I moved straight to Doha where I began my career in teaching. I spent my first two years working in a small kindergarten and special educational needs center, with children from 3 to 8 years old. After completing my contract, I then moved to an International School, where I have spent the last 4 years teaching in the Early Years Foundation Stage. I am extremely passionate and find it very rewarding to be a part of and support children with their first steps into school life. Living in Doha for the past 6 years has been an incredible experience and is a place I truly consider home. Outside of school, I enjoy travelling, looking after my beautiful cat and going to exercise classes such as yoga and spinning. I’m so excited to be joining the RGS Qatar team and meeting my new class! I studied Psychology, Early Years and Education at Nottingham Trent University in 2008-2011, where I had the opportunity to work within a variety of different schools and nurseries from babies to year 6. After I graduated I pursued my desire to be a teacher and began studying for my PGCE at Newman University in 2012, where I focused on Early Years education. While studying I was able to visit the Gambia and work with children in a developing school. After achieving my teaching qualification, I decided to travel the world which is a very strong passion of mine. I returned to work in a school in England near where I used to live. I completed 3 years there and enjoyed my time thoroughly, but fancied exploring the world while teaching, and this is how I arrived at RGS Guilford in Qatar. During the school term in my free time I enjoy yoga and relaxing while reading Harry Potter! During the holiday, I love to travel and we are planning many trips to visit all the beautiful countries close to Qatar in the next few years. I completed an undergraduate degree in Intermedia Art, at The University of Edinburgh. During this time, I also took the opportunity to live and study in Prague for one semester. Following my graduation, I returned to England, where I fulfilled my dream of becoming a Teacher; by completing a PGCE at The University of Huddersfield. After completing my NQT year, I decided that I would like to continue to explore the world, so I chose to travel to Australia. Whilst in Australia, I enjoyed working with children with special educational needs and disabilities. I am very excited to relocate to Qatar, where I am honored to be joining RQSGQ as a Reception Teacher. When I am not teaching, I enjoy spending time with family and friends, being outdoors, reading, watching movies, listening to music and visiting galleries. I am originally from Chorley, Lancashire in the North West of England and I have spent the first two years of my teaching career in a small school in a town called Bolton, before moving to RGS Guildford in Qatar. I have a very close, large family some of whom are based all over the world (so not all that close)! I love spending time with my closest family, especially my three beautiful nephews. The spark for teaching began as early as high school, when I studied childcare as a GCSE. From this point on I knew I wanted to work with children and be a part of their education in some way. Before starting my teaching career, I worked as a nursery nurse in a Private nursery whilst studying my degree of Education and Business Studies at University of Central Lancashire in Preston. After completing my degree, I then started my teacher training through School Direct - at Prestolee Alliance based in Bolton – where I achieved my Qualified Teaching Status. There are many motivators in my life out of school which inspire me to be an enthusiastic and active teacher. I enjoy going to the gym regularly and exploring new places while taking long walks with my dog at the weekend. I am truly passionate about travel and this is what inspired me to make a huge life change and venture to Qatar, where I can incorporate my love of travel into my love of teaching. After I graduated from Northampton University I worked in a small state school in Rickmansworth, England, teaching Year 1. It was a great experience especially planning exciting and challenging learning experiences to cater for 22 boys in one classroom. I moved to Qatar in 2015 to work for a new school and taught Reception, which I thoroughly enjoyed. During my 2 years in this school it was fantastic to see the school develop and the small community of parents and children flourish and grow. RGSGQ is an exciting place to be and I have felt welcome from the second I stepped foot in the door. I believe that children that are happy and confident in their learning environment with a ‘can do’ attitude will continue to thrive and develop a love for learning. Outside of school I love to travel and learn about a mixture of cultures. I thoroughly enjoy going to the gym and playing sports such as netball, tennis and squash. Also, whilst in the Middle East I like to take advantage of the lovely weather and go paddle boarding and kayaking. I am originally from a small city in Ireland called Armagh. I studied a masters of pharmacy at Queen’s University Belfast as I had a strong passion for science. I love working with children and have always wanted to be a primary school teacher from a young age. During my first summer of university, I taught English as an additional language to children in a summer camp in Austria. I had such a wonderful experience teaching these children that I decided to do Camp America for my remaining summers at university. I attended a camp in New York for three summers, coaching gymnastics and living with, and taking care of the youngest girls on camp. After graduating I moved to Liverpool, where I studied a PGCE in primary school teaching at Hope University. I enjoyed working in the schools in Liverpool so much that I decided to start working in a primary school in the city. Outside of school I coach gymnastics, dancing and speech and drama. I am very much looking forward to becoming a part of the RGSGQ school community, and teaching year one. I am from a town called St. Helens in the Liverpool borough of Merseyside in the North West of England. I studied English Language and Education at Liverpool Hope University before going on to complete a School Centered Initial Teacher Training program in Lancashire. My first teaching post was close to home, in Reception for a year, before I decided to test myself in the cosmopolitan city of London in a renowned academy for a further year. I felt a natural progression for my third year would be to experience teaching in an entirely different continent, which brought me to the Royal Grammar School Guilford in Qatar. From a professional perspective, I am delighted to be working in a school that is linked to such a prestigious school back in Guilford and being part of such an amazing project. In my spare time, I love to play and watch sport. Furthermore, I like history, reading and travelling. I am originally from a small town called Penrith, right in the north of England, situated in the heart of the Lake District. I moved to Newcastle to study my first degree in Applied Sports Science and Coaching, at Northumbria University. It was here I was given the opportunity to organize my own placement, in which I spent 6 weeks working in both a Year 4 class and PE department of a local primary school. This is where my love for teaching and working with children of a primary age range began. When I realized my dream of playing for Manchester United was unlikely to happen, I decided a career in teaching was something I could be equally as passionate about. I remained at Northumbria University to complete my teacher training PGCE and spent two years teaching in Newcastle before embarking on a new adventure to Doha. My parents lived and worked in Qatar from 1979-1988, so the country has always held a special place within my family, and certainly made the decision to move here an easier one. When my mum and dad visit, they can't believe how much it has changed the past 30 years! I have just finished my third year teaching here in Doha. I love the opportunities it gives to travel and explore new cultures. My favorite places are the MIA Park and the Doha Golf Club (which is where I spend most of my free time). I am originally from a small town in the North East of England, Hartlepool. I lived in Liverpool for four years, whilst gaining my foundation, post-graduate and Masters degree. I began my teaching career, as a year 4 teacher in a three form entry school in Hartlepool. I thoroughly enjoyed my first year in KS2 and it was a fabulous opportunity to extend my skills, as the majority of my teacher training was KS1 based. In 2016, I decided I needed a new adventure and I moved to Doha, Qatar to join an international school. For two years I have been a year three classroom teacher, I have enjoyed the new experience of working in an international school and the opportunity to explore different countries within the Middle East. I am delighted to be joining RGSGQ and look forward to the opportunities it may bring. Outside of school I have a passion for travelling, I thoroughly enjoy embracing and learning about different cultures, in different parts of the world. I enjoy taking advantages of the warmer climate in Qatar and taking part in water sports, however I am still a work in progress! Hello, I’m Vicky and I have been in Qatar for three years now, I love it here and now consider it my home. Since arriving, I have taught year four. I am very excited to start at RGSGQ and experience another school in Qatar. When I’m in Qatar, I love to try new things, especially new restaurants and occasionally water sports. I also love travelling, I have been lucky since arriving in Qatar to visit some incredible countries and see some astonishing views. I am always thinking about where I will go next! Originally I am from a small town in Essex, where I live with my mum and cute pet rabbit Petra. I went to University in Canterbury, Kent and studied primary education for three years. After completing this, I decided to do a year’s supply work this took me to Central London, which was amazing! I learnt so many new things there. After that I worked in a year three class for three years, that is when I decided to move abroad which had been a dream of mine for years! From my first day in Qatar I have never looked back. I live in Kingsbridge, which is a small town in the South-West of England. I completed my teaching degree in the coastal city of Plymouth before moving to London and teaching year 3. For the last two years I have taught a combined year 3, 4, 5 and 6 class in Holbeton Primary School, South Devon. Teaching in such a small school, with only 36 pupils has at times been challenging but I have loved every minute. Outside of school, I enjoy travelling and experiencing different cultures and values. I am an enthusiastic sportsman with a particular interest in football. I also play the guitar and partake in water sports. I graduated from the University of Winchester in 2010 after four years of studying and left with a degree in Primary Education (hons). I started my career working in a large four form junior school in the south of England. I taught both upper and lower Key Stage 2 and became Head of Standards for Year 4 being responsible for 120 children. Whilst at the school, I was in charge of making links with the community and organized a trip to London to be part of the Commonwealth celebrations held in Westminster Abbey. I also helped run the school’s cross country team. After five years, I transferred to another school within the academy chain becoming Head of Year 3 at what was an outstanding junior school. During my teaching career, I have been a governor both as a staff representative and as co-opted member in charge of overseeing the progress of disadvantaged children. This is my first time working abroad and I am very proud to be part of the RGSGQ, being able to help bring the 500 years of outstanding education to Qatar. Outside of school I love to travel and have recently visited India for the first time. I also enjoy running, playing the piano and chess. After graduating in 2011 from Exeter University with a Masters in Sport and Health Science, I have enjoyed a varied career working in Oil and Gas, and the construction industries before training as a KS3 Science Teacher in the UK. My academic passion is exercise physiology, a study combining all three sciences in relation to human performance. I enjoy sharing my enthusiasm for science, and trying to inspire inquisitive minds by encouraging students to read, think scientifically, and explore the world around us. A good scientist will always have a questioning mind, in the pursuit of scientific truths. Away from teaching, I have a myriad of interests; I am a keen cyclist, an occasional 'triathlete', and am generally interested in both playing and watching all sports. I also have an interest in travel, surfing, photography, reading and playing guitar. Anything outdoors is of interest! I am excited to be beginning my journey with the Royal Grammar School, Guildford in Qatar, and to be a part of a successful future within a caring and supportive learning environment for the students to achieve their potential. I grew up on the east coast of England, in the beautiful county of Suffolk. After graduating from Cambridge, I moved to the midlands and taught in schools in Worcestershire and Birmingham. My husband and I left the UK in 2011 to embark on our international adventures. We lived in the Netherlands and France before arriving in Qatar in 2016, with our young family. Our eldest daughter Emma, is currently in Year 1 at RGSGQ. We could not be happier with our choice of school for Emma. There is something very special about the RGSGQ family; from the commitment, drive and enthusiasm of the staff, to the supportive and friendly Parent's Association. I am very excited to now be part of the new Senior School team. The aim of promoting enquiry and interpreting different ideas lies at the heart of my teaching. My objective has always been to make students think – to wonder at their own experiences in comparison to those of other people; to engage with the subject and to develop an awareness of and a respect for people and cultures that differ from their own. My background is in teaching social studies & humanities - both of which encourage students to consider and reflect upon their own particular world experience and to develop a sense of themselves as a citizen within a global community. The fabulous weather here in Doha means that much of my spare time is spent splashing around in the pool or the sea with my children. However, when I do get some time to myself I practice yoga and enjoy sailing. Since the age of 16, I have been involved in coaching and teaching a variety of different sports across Buckinghamshire, England. I have worked in a British independent school and a brand-new secondary school and both share a similar ethos to RGSGQ. Teaching physical education is extremely rewarding, as it can bring so much joy to students, irrespective of their ability. I believe that regular participation in sport can ensure that young people are happy, healthy and confident individuals. Outside of school, I am a keen observer and participant of all sports and I am never too far away from a racquet ball, or a pair of running shoes! I also enjoy visiting new destinations and learning about their history, culture and trying their cuisine. Originally from Ireland, I lived in Liverpool for 5 years where I completed my Teaching Degree. Following my graduation from Liverpool Hope University in 2016, I secured my first teaching job in a Year 6 class and I loved every minute of it. I have taught across the Key stages, but working in KS2 is where my passion is. It was hard leaving Liverpool but I was ready for a new adventure. I arrived in Doha late August and have loved every minute of it. Outside of school I have a passion for travel and I cannot wait to begin exploring the Middle East. I also have a keen interest in sports, mainly Gaelic Games. Following my graduation from my Masters in Physical Education at the University of Limerick, I have worked in a variety of schools in Ireland. I am proud of my role as Physical Education Teacher at the Royal Grammar School, Guildford in Qatar. The school ethos of creating a happy and caring environment, where students can progress and flourish and feel confident about their abilities, whilst respecting one another are values which are in line with my own beliefs. Physical Education and involvement in sport can bring a whole host of positive attributes to students. When students recognize that involvement in sport is more than just winning and losing, physical activity encourages skills and resilience for all parts of life, and most importantly it helps to create confident and passionate students. I have been teaching Music for 9 years now in both Primary and Secondary schools and it has been such a rewarding journey so far. I trained at London College of Music and Media studying Contemporary Performance in Popular Music (BA) and went onto complete my PGCE Education in Music at the London Metropolitan University. I am passionate about teaching music and have a love for composing and performing music. Outside of school I am an active person. I enjoy diving, running, kayaking, hikes and love exploring new destinations. After graduating with a BA in music from the University of Leeds, specialising in contemporary composition, I gained my PGCE in education from the University of Huddersfield – in that time I taught music in several schools in the north of the UK. I am extremely proud to be the first music teacher at the RGSGQ, where I hope to encourage a culture of musicality, with students embracing their opportunity to perform both in and outside of the classroom. I believe in performance-led music lessons, where music can be used expressively, to build confidence and to encourage positive social interaction. Outside of the classroom, I perform regularly with my band, have recently developed a passion for running and enjoy travelling to new places. I was born in Paris and grew up in a small town in the northwest of France, in Brittany. During my childhood I had the opportunity to travel in Europe with my family. Travelling abroad helped me open and broaden my mind. That’s why I decided to study foreign languages later in university. During my degree I had the opportunity to work in Spain and London. After graduating, I decided to leave France and train as a teacher in Bristol. Then I taught French and Spanish in two Grammar schools near London, and Canterbury in Kent. It was a great experience where I learned so much and met really interesting and nice people from different cultures! However, after a few wonderful years in the UK I felt it was time for me to go back to “La Bretagne” Brittany in France where I worked as a certified teacher for a few years. I do feel like a citizen of the world and for that reason I decided to move to Qatar, as I was really interested in experiencing a new culture and to work in an international environment. I am really proud to be part of RGS and its diverse community. Outside of the classroom, I enjoy being active, going to the gym and travelling to new places. My other interests include making sweet and savory crepes, going to cafés, watching international movies and reading the news online. My name is Safaa Ghabbach, from Lebanon, I graduated from the Lebanese University, Faculty of Education, Arabic language and social studies. After my graduation, I moved to Canada where I joined an English school during the week days to improve my language skills (in addition to my French knowledge). I eventually went on to teach Arabic language to non-Arabic speakers. When I left Canada and came to Qatar, I started my teaching trip in an independent Qatari school having gained the necessary experience to start the real education journey in schools. Following that I joined the French-Qatari school, Voltaire, (where my children are currently studying) and taught the Arabic language curriculum and Social studies. I then worked at Newton School for a while before joining the elegant Royal Grammar School. At RGSGQ the teacher has the feeling like that of a student; comfort, safety and joy. Education in my opinion is an integral part of our lives, it starts from childhood and leads us to infinity. In my view, education is the quality of achievement and the outcome that the child receives within the potential of each individual. I am proud of my job, because the teacher is there to provide the necessary knowledge to create future generations and leaders; and I am proud to be a mom of every child in my class before I am a teacher. Here begins the progress of the nation and its prosperity. Out of school I take care of my small family: my husband and my three children. My hobbies are listening to quiet music, shopping, walking, and building social relationships with all segments of society. Originally from Palestine I came to Doha in 2010 with my husband and my three children (two daughters and a son). I lived in America for 15 years where I taught Arabic and Religious Studies in various Islamic schools in Ohio and Michigan for over eight years. This gave me a wonderful experience in how to manage students especially in primary school. My husband then took a leading role in an international company in Qatar and we moved with him. I have since been enjoying the quiet life in Qatar where I can spend a lot of quality time with my family and friends. I was also blessed last year with the birth of my third charming daughter who is keeping me active and diligent. Before taking up my role at RGS Doha I had been teaching in Newton International School for about two years. I have taught both Arabic and Islamic Studies to students aged 6 to 11 years. I am excited to implement and further develop my skills in my new role at RGSGQ. I really enjoy teaching and believe that the biggest joy in life is attained when you give it all you can. Outside of school, I enjoy traveling, cooking and reading. I am looking forward to working with the students and their parents as I believe that both teachers and parents have to join hands and collaborate to make sure the student is getting all needed attention and is progressing well. I was born in Kuwait in 1989. I began studying at Qatar University in 2007, specializing in Arabic language and literature. Shortly after graduating, I got married. It’s always been a dream of mine to study the Arabic language, as it opens up many doors. Now I am very happy to join the RGSGQ team, as I hope to teach the pupils, whom I consider little angels and builders of the future. I will do my best to educate and look after and connect them with accurate and clear information. In my spare time, I do my best to take care of my husband and my children, traveling, and cooking. My name is Razan Amoun and I was born on 15/04/1995, in Lebanon. In 2016 I graduated from the Beirut Arabic University, Faculty of Business Banking and Finance. I speak three languages; Arabic, French and English. While studying at university I attended various educational courses which inspired my love of teaching. After graduation, I found my first job as an Arabic teacher in Inayah School in Lebanon where I stayed for one year. Then my husband’s job brought us to Qatar where I am in love with my new role as an Arabic teacher to non-Arabic speakers, in my second home, RGSGQ. I’ve been married for two years and I am a mom to my eight-month old boy named Adam. I have traveled to France, Spain, Italy, Switzerland, Turkey, Saudi Arabia and Syria; and as well as travelling, it’s shopping, reading and cooking that makes me happy. My Quote: A teacher takes a hand, opens a mind and touches a heart. After graduating from York University, I travelled to Chongqing, China to teach English. This ignited a passion for both teaching, travelling, and experiencing new cultures. Returning to the UK, I completed a PGCE in Primary Education and a foundation degree in Mandarin Chinese. After a brief period teaching in the UK, the lure of international teaching beckoned and I have enjoyed working in classrooms in both China and Thailand. Whilst in a role as Head of Early Years, my interest in the early identification of additional needs and interventions led me to diversify and gain an MA in SEN and Inclusion. I am keen to ensure that all children have the opportunity to succeed and be the best they can be, regardless of their level of need. Outside of the classroom, I enjoy quality time with my young daughters and family, travelling to new places and if I have the opportunity spend some time on my yoga mat! I am from Philippines, married and with four children. I graduated with a Bachelor of Arts degree, majoring in Psychology. I practiced my profession in Human Resources for four years, but my interest for working with children has taken me to the field of education. To be a licensed professional teacher, I pursued a course in education and managed to pass the licensure examination for teachers. I have been working in various schools for more than 10 years now. I am proud to be part of distinctively reputable RGSGQ and grateful to be its librarian. Being around books has brought a wonderful environment for the pupils, fostering a love of reading. The good camaraderie we have built has given me more enthusiasm to fulfill the librarian's tasks, thus I make sure that everyone steps in the library will get the stunning book and my sincerest assistance. When I am not working, I constantly communicate with my sons in the Philippines, to regularly on check them and spend time with my daughter, who is with me here in Doha. I help her with her revision, watch movies, and run at Aspire, sing karaoke and dance once in a while. I treasure being here in Qatar, but always look forward to seeing my home country and I hope to one day visit my sister and brother in Sweden and Italy. I grew up in London and have lived there all my life before moving to Qatar in May 2016. After Graduating from the University of Roehampton in Psychology and Counselling, I decided to pursue a career in Finance. I initially relocated to Qatar in 2016 to continue my career in Finance but soon learned that I wanted a change. I was seeking a new working environment that was fun, where no day was the same and that could offer personal growth - and where better to find these things than in a school! I love the food, culture and weather in Qatar- even surprisingly when its super-hot outside, it beats the often grey sky in London! I am pleased to be a part of the admissions team for such a reputable school and look forward to the years ahead. In my free time I love to travel and have been fortunate to visit both Bali and India this year and often enjoy visiting friends and family back home in the UK. I enjoy baking and love to shop, you will often find me in the Mall of Qatar in my free time. My favorite quote: “A ship in harbor is safe but that is not what it is built for”. Hello, my name is Imane, I’m from Morocco I born in Rabat .after I finished my studies ( science experimental) My dream was to work in a big and international school, therefore, I started my carrier as a teacher in primary school teaching French language and Mathematics. Six years later I joyed my husband here in Doha where I worked as Kids Club & Recreation Supervisor, Designated Trainer in Five stars hotel mixing between childhood experience, luxury customer service style experience for six years. Beside that I have done courses such as TK (Teaching Kids knowledge ) including class room management in international house institute, EYFS ( Early Years Foundation Stage )and C1 level in the French language in French Institute in Qatar . in addition to that, I got fire warden and First Aid certificates. Therefore I decided to go back to the education environment where I worked as an admin position in the nursery( following the Montessori way). After all these destinations and experience finally my dream become real as I got chance to joined RGSGQ, I’m extremely proud of that especially with our wonderful team and the environment. Outside of school, I like shopping, travelling, reading and giving all care to my little family. I am originally from South Wales in the UK and as soon as I’d graduated from art college I headed to Paris, France, to work as an illustrator and design assistant. I eventually returned to London; and soon after, I met my husband, then decided on a complete career change before heading overseas on our first expat’ posting. I think I qualify as a long term British expatriate having lived and worked in the Caribbean, Bahrain, Syria, Russia (where I qualified to teach English as a foreign language) and I first arrived in Qatar in 2010, working as a writer/editor for two regional publications. This provided an opportunity to meet, interview and write about numerous interesting people, local and expatriate; and I appreciate being surrounded by and working with a spectrum of cultures and nationalities. I’m proud to say I’m the first employee that RGSGQ enrolled; 20th March 2016, I became PA to the Head of School. From that first day, witnessing the creation of a brand new school come to life has been a colourful, rollercoaster of a journey; packed with challenges, dramas, achievements and rewards and I’ve learned far more than I expected to along the way. When I’m not at the School, I love reading and sketching; and Qatar feeds my passion for art with its countless exhibitions; also I continue to write freelance articles, having a wealth of topics right on my doorstep; and there are all those malls . . . and all those restaurants . . . and of course there is always the gym, which is constantly on my ‘to do’ list. I was born in Mangalore, the southern costal part of India, completed my graduation in Agra university in North India and post-Graduation MBA-HR in St Joseph’s Engineering College affiliated to Visveswaraya University, Belgaum, Karnataka. Prior to my post graduate, I have worked in a school setting and always felt wonderful working in education. Outside school, I have also worked for a group of holding companies in Qatar, for past 8 years with diversified business activities. Outside of school life, I am passionate about Football, Basketball and Volleyball. Cooking is another hobby I enjoy, as well as listening to classical Indian music. I live with my spouse and 3 children here in Qatar. Greetings! My name is Adnan Abusoud and I am from Chicago, Illinois in the United States. I am pleased to serve the RGSGQ community in my role as the Head of Marketing. Before commencing my international journey, I studied Political Science at Benedictine University in Lisle, Illinois a small suburb 20 minutes outside of Chicago. Upon graduating, I decided to move to Qatar with my family and accepted a position at Qatar University, recruiting for their Admin staff. I feel honored to work with such a diverse and dynamic group of students, staff, and teachers at RGSGQ. I enjoy spending time with my dog, kayaking, Brazilian Jiu-Jitsu, basketball, football, reading and traveling. After pursuing a Computer Science and Engineering degree in India I started my journey in the field of Information Technology as IT Support with a private company in India, utilizing my academic professional knowledge for two years. I initially flew to Qatar in 2010 and joined an advertising company where I worked for a year. Subsequently, I joined my second company in Qatar and committed myself for 6 years wherein I have been able to further strengthen my technical acumen and developed skills in IT. This knowledge has enabled me to operate in servers and networks and master multiple IT skills like virtualization etc. Throughout this period of employment, I gained experience of working in numerous environments such as Aviation, Education, Automobiles, Trading, manufacturing and contracting, Maritime, Sports and fitness. It was a wonderful opportunity for me. Having worked in the education sector with more than 3000 students and 500 teachers and staff, I can say that I am equipped in fulfilling the RGSGQ vision and mission in the field of Information Technology support. I feel honored and proud to be part of RGSGQ, in being able to contribute not only my ideas from my previous experiences but my general passion for innovation for the success of the organization. The environment in RGSGQ is amazing and very welcoming. Some of my favorite leisure activities are reading books, music, movies, and traveling. During my spare time, I am always engaged in sports activities such as football, badminton, volleyball, swimming and running. Also, I keep learning new technologies and courses online to keep me updated on my profession. I am originally from the Southern part of India. After graduating in commerce, I completed a diploma in Graphic Design and then worked as a designer in India for three years, in various fields, before my move to Qatar where I initially took up work as a photographer alongside a designer. I am so glad to be working in the educational sector and I am proud of my work. I am delighted to start a new chapter with the Royal Grammar School. It has been a marvellous experience so far and I enjoy working as a support to the admin team. In my free time, I like to do Art work and I love to draw portraits of people and nature in Pencil, Watercolour and Oil painting. I also love to cook and like to create some of my own recipes, whilst also using YouTube for inspiration. I like to watch horror and thriller movies and I thoroughly enjoy listening to music, especially from Bollywood and Hollywood.